During the information session about the upcoming contract for the first-stage design of the Core Plasma Thomson Scattering (CPTS) diagnostic for ITER. An information session was held at F4E about an upcoming contract for the first-stage (system-level) design of the Core Plasma Thomson Scattering (CPTS) diagnostic for ITER. 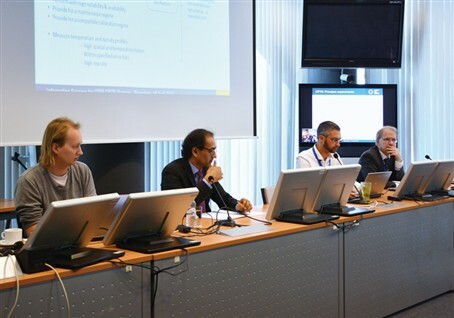 Representatives of seven companies and three European fusion laboratories with potential interest in this contract gathered in order to learn more about the scope, structure, requirements and tendering procedure. The agenda also featured brief presentations by certain participants to provide F4E with an early perspective on the capabilities and experience held by interested parties and to promote networking between participants who might consider partnerships for this business opportunity. For F4E, this meeting was also an opportunity to get feedback on its strategy for this contract. The Call for tender is expected to be launched in June 2015. The Core Plasma Thomson Scattering (CPTS) diagnostic system will measure the temperature and density of electrons at different points across the ITER plasma. These measurements are needed to study how a fusion power plant might be operated continuously. The diagnostic technique involves shining an intense pulse of laser light into the plasma, which is dispersed (or ‘scattered’) by electrons in the plasma. Because the electrons are in motion (due to their high temperature), the scattering process changes the (single) colour of the laser light into a broad colour spectrum. Thus, by measuring the spectrum of the scattered light, the temperature of the electrons can be determined. Similarly, the strength of the scattered signal depends on the number of electrons along the path of the laser beam and by measuring the intensity of the scattered light, the density of the electrons can be determined. By repeating the laser pulses at the desired rate and performing fast computations to analyse the data, the temperature and density of electrons across the ITER plasma can be provided in real time, thus allowing control of the plasma towards continuous operation.